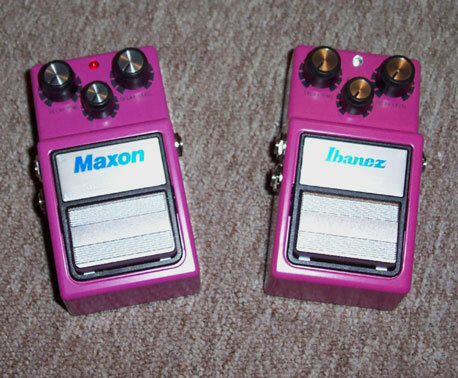 AD-9 Analog Delay Reissues from Ibanez and Maxon go Head to Head! This past January 2005, Ibanez unveiled its plans to reissue its AD-9 analog delay at the NAMM show. Maxon beat them to the punch with its release of its own AD-9 back in January of 2003. The vintage AD-9 circuit (originally made by Maxon for Ibanez) was always one of my personal favorite delays. Its warmer and slightly darker repeats always sounded more musical and natural than what my digital delays produced. I still have and use a digital delay for some applications, but the character of a good analog delay is thoroughly enjoyable and difficult to capture from anything other than a genuine analog delay. They’re also very easy to use. I like my Boss DD-6 digital delay unit and all that it does, but the simplicity and “just play damnit!” feel of the vintage AD-9 is really desirable at many times. All three AD-9’s (the vintage model, the Maxon reissue, and the Ibanez reissue) have basic controls for Delay Time, Feedback, and Delay Level. Two outputs allow stereo operation for very cool doubling-guitar effects or echo-room bounce back effects as one output is dry only, the other effect only. All AD-9’s are powered by a single 9v battery or 9v DC standard regulated power source (recommended). Interest and prices on used vintage analog delays continues to grow. Clean examples of vintage AD-9s commonly sell for $200+ on the used market as do Boss DM-2 and DM-3 units which also remain popular. Maxon released its AD-9 as part of its nine-series and of course was also the OEM manufacturer for the original Ibanez-branded AD-9. The new Ibanez AD-9 is now manufactured by Ibanez along with the company’s TS-9 Tube Screamer, which Ibanez begun production on when contract agreements ended over two years ago between Maxon and Ibanez.